I first tasted mahi-mahi when I lived in Saipan, and I fell head over heals for it. Until that time my experience with seafood was rather limited, and I didn’t realize that fish could taste so good and have such a nice texture. I enjoyed plenty of mahi-mahi and wahoo during my four years on the island. When I came back to the U.S. in the late 90s, I was thrilled to find mahi-mahi available in Midwest grocery stores. Now I buy fillets in freezer packs from the warehouse club and keep some on hand at all times. This is one of those meals that I almost never make the same way twice. It’s a great dish for cleaning out your vegetable drawer, and I usually just pull out whatever is in the frig. This time I happened to have some broccoli, bell peppers, and snow peas on hand, so that’s what went into the pan. For the wine I’ve used chardonnays, pinot grigios, and even mirin. I start the onions first, then add the vegetables and cook them for just a minute or two, until they start to glisten, then I lay the fillets on top and cover. The steam does all the work and the wine and lemon juice add subtle flavor to the dish. In the large skillet, heat the olive oil and cook the onions over medium-high heat for about 2 minutes. Add the garlic and the remaining vegetables and cook for about 2 minutes, just until the vegetables start to glisten. Add the wine and lemon juice and stir. 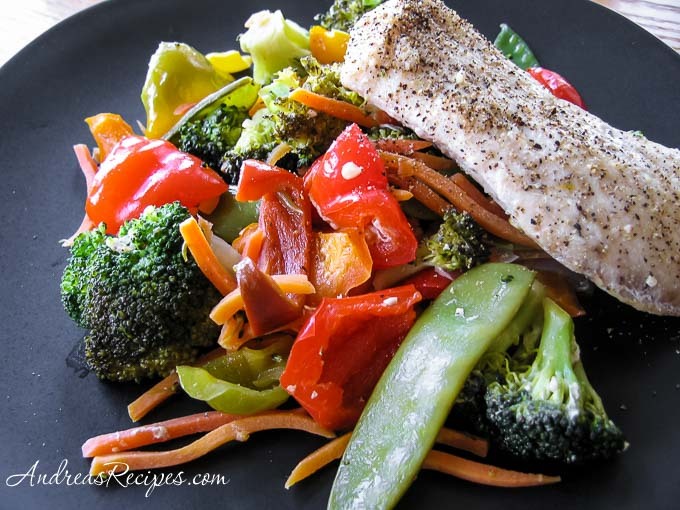 Pat the mahi-mahi fillets dry with paper towels and lay on top of the vegetables. Salt and pepper the top side of the fillets to taste. Cover and cook 4 to 5 minutes. Turn the fillets over and salt and pepper side to taste. Cook another 4 to 5 minutes or until the fish flakes easily. Squeeze some more lemon juice on top and serve immediately.